The second phase of the Gender, Agriculture and Assets Program (GAAP2) is hosted within A4NH. GAAP2 aims to develop measurements for women’s empowerment in agricultural development programs and a large number of projects chosen to be part of GAAP2 seek to improve nutritional outcomes either through direct interventions or indirectly via increases in income through commodity value chains. This validated indicator for tracking women’s empowerment will contribute to better design and evaluation of nutrition-sensitive agriculture projects. An inception workshop for GAAP2 was recently held in Nairobi. A4NH gender researchers were among the participants of the workshop. This blog, originally posted on the GAAP website is the first in a series of blogs about the workshop. On January 27-29 2016, the IFPRI-led Gender, Agriculture and Assets Project held an inception workshop to kick-off its second phase (GAAP2). 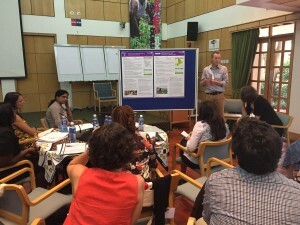 The workshop was organized in collaboration with AWARD at the beautiful World Agroforestry Center (ICRAF) campus in Nairobi, Kenya. About 60 people participated in the workshop, including the GAAP2 core team and partners, the GAAP2 External Advisory Committee (EAC) and most importantly representatives from projects that have been short-listed to be part of GAAP2. Learn about measures of women’s empowerment, particularly the Women’s Empowerment in Agriculture Index (WEAI) and their uses in development programming. The GAAP2 core team presented the WEAI and its modifications (the Abbreviated WEAI or A-WEAI). The presentations focused on the rationale behind the creation of the index, its strengths and weaknesses and how it has been applied so far. The next stage of the WEAI will be the development of the pro-WEAI which will be implemented by the GAAP2 projects and the integration of the pro-WEAI into the projects’ impact assessment plans. Project teams presented their interventions and proposed impact assessment strategies in a poster session - the GAAP2 portfolio has a diverse mix of projects ranging from livestock interventions to home gardens to financial inclusion programs and nutrition-sensitive agriculture extension programs. This was followed by a trivia contest about the information presented with exciting prizes (chocolates and coffee) for those with the highest points. The second day of the workshop was dedicated to developing the pro-WEAI. The group was divided first according to project themes (livestock, crops, income, nutrition) and then dimensions of women’s empowerment (access and use to information, individual empowerment, intrahousehold dynamics, physical mobility, empowerment with respect to nutrition). The purpose of the group work was to (a) propose additions or modifications to the existing A-WEAI module and (b) brainstorm over potential add-on modules to the A-WEAI. The group sessions resulted in some great ideas which will be used by the GAAP2 core team to develop survey modules for the pro-WEAI. An important feature of GAAP2 is the CoP which will allow members of GAAP2 to communicate and collaborate with each other throughout the duration of the project. In addition to the GAAP2 CoP, a larger community will be created for those interested in following the project and using the pro-WEAI in their work. There were many opportunities for participants to get to know each over the course of the workshop. Project teams not only met each other and learnt about their respective projects, but also got introduced to the members of the GAAP2 team who will support the projects with their research. Panel discussion on women's empowerment - what works?